A few months ago, I received an invitation to come check out the changes made at Kurdis Grill in Downtown Tampa. We finally got around to check it out last week and I will be the first to say, this meal blew us away. There were multiple times during dinner that we both sat speechless and wide-eyed and at one point, my husband stated "I think this is what it must feel like to be a judge on Top Chef". Yes, it was that good. Kurdis is a small restaurant located on the bottom floor of Skypoint who offers a unique fusion of Mediterranean and Middle Eastern cuisine. Their bar offers a nice wine and craft beer. Since the location is so small, everything is fresh and brought in daily. They try to source as much local product as possible. Chef Fred came out to say hi and brought us a few small plates to start off our meal. The first was Sauteed shrimp basted in butter and thyme with asiago polenta and marinated tomato broth. The flavors in this bite went on and on. I cannot explain it, other than perfection. Our second small plate was dried shitake crusted filet with quiona salad and a founders porter butter sauce. The filet was so tender that it literally melted in my mouth....and that founders porter butter sauce - holy wow. The first thing I noticed on the menu was the Duck Fat Confit Pork Belly appetizer. 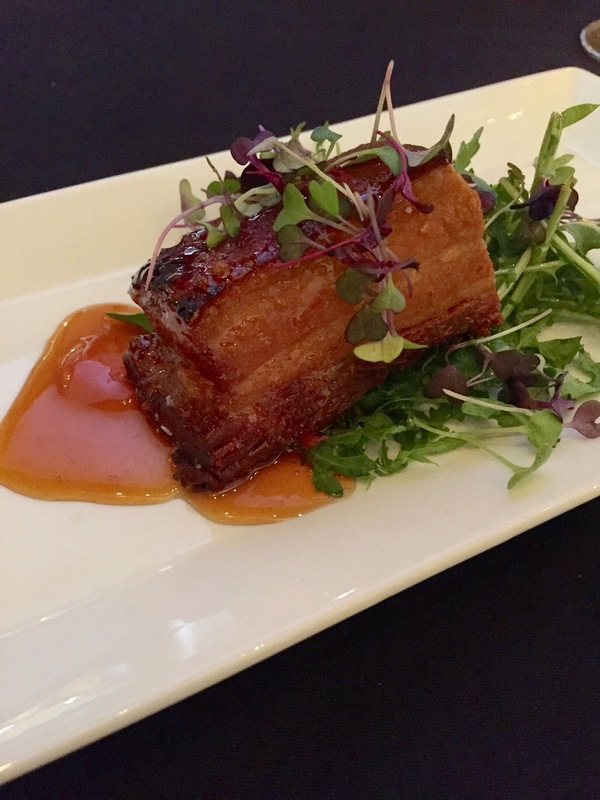 It was hands down the best pork belly either of us have tried and it paired perfect with the arugula salad with an apple gastrique. I strongly suggest this appetizer to anyone who visits Kurdis. When it came time to order entrees, I was already feeling full. We asked our server which two dishes he recommended and it happened to be the two we were looking at - Grilled Moroccan Lamb and Beef Tenderloin. After the amazing small plate of filet, I had to get the Beef Tenderloin Medalions with baby carrots, truffled mashed potatoes and red wine jus. The beef was amazing but those truffled mashed potatoes - seriously now. Gabe kept attacking my plate and this is coming from a guy who does not like his mashed potatoes fancy (just butter and S&P). I almost stabbed his hand twice with my fork. They were incredible and I want to eat them every day of my life. Gabe ordered the Grilled Moroccan Lamb with arugula salad, grilled scallops and basmati rice. The lamb was perfectly seasoned and cooked. Chef Fred said that they have a super secret lamb rub that they lock away. When we left, I called my parents, letting them know that on their next visit we would take them to Kurdis so my Step-Dad could get the lamb. We were too stuffed to even consider dessert but know that this will not be our last trip to Kurdis. In fact, we booked our Valentines Day dinner there. Kurdis is offering a 5 course meal for $75 a person. After our dining experience and seeing the menu, there was no question. Plus, I know others have had equal experiences to ours - my friends at Never Have I Ever Tampa had an incredible dining expereince which you can read about here.